There’s an elephant in the room when it comes to the Raspberry Pi Zero. The Pi Zero is an immensely popular single board computer, but out of stock issues for the first year may be due to one simple fact: you can run a Nintendo emulator on it. Instead of cool projects like clusters, CNC controllers, and Linux-based throwies, all the potential for the Pi Zero was initially wasted on rescuing the princess. Espressif has a new chip coming out, the ESP32, and it’s a miraculous Internet of Things thing. It’s cheap, exceptionally powerful, and although we expect the stock issues to be fixed faster than the Pi Zero, there’s still a danger: if the ESP32 can emulate an NES, it may be too popular. This was the hypothetical supply issue I posited in this week’s Hackaday Links post just twenty-four hours ago. Hackaday fellow, Hackaday Supercon speaker, Espressif employee, and generally awesome dude [Sprite_tm] just ported an NES emulator to the ESP32. It seems Espressif really knows how to sell chips: just give one of your engineers a YouTube channel. This build began when [Sprite] walked into his office yesterday and found a new board waiting for him to test. This board features the ESP-WROOM-32 module and breaks out a few of the pins to a microSD card, an FT2232 USB/UART module, JTAG support, a bunch of GPIOs, and a 320×240 LCD on the back. [Sprite]’s job for the day was to test this board, but he reads Hackaday with a cup of coffee every morning (like any civilized hacker) and took the links post as a challenge. The result is porting an NES emulator to the ESP32. The ESP-32-NESEMU is built on the Nofrendo emulator, and when it comes to emulation, the ESP32 is more than capable of keeping the frame rate up. According to [Sprite], the display is the bottleneck; the SPI-powered display doesn’t quite update fast enough. [Sprite] didn’t have enough time to work on the sound, either, but the source for the project is available, even if this dev board isn’t. Right now, you can order an ESP32; mine are stuck on a container ship a few miles from the port of Long Beach. Supply is still an issue, and now [Sprite] has ensured the ESP32 will be the most popular embedded development platform in recent memory. All of this happened in the space of 24 hours. This is awesome. Now, there’s a new module that’s even cheaper and more powerful than the ESP8266, and just like all of our favorite parts from China, it inexplicably shows up on eBay and AliExpress before anywhere else. It’s the Realtek RTL8710, available on eBay, on AliExpress, and elsewhere around the web for about $1.50 per device. There’s also a dev kit for the device featuring breakouts, an additional microcontroller, and a few switches and buttons for about $15. As you would expect, there is zero English-language data available about the RTL8710, everything is in Chinese. There is a forum of sorts going over this new chip, and the Google Translatrix is good enough to glean a little bit of info about the new chip. The RTL8710 features an ARM processor clocked at 166MHz. Stock, this module is running FreeRTOS. There’s 1MB of Flash, 48k of RAM available to the user, up to 21 GPIOs, 3 I2C, 4 PWM pins, and 2 PCM. This module also comes with an FCC logo, but I can’t find anything on the FCC website about this module. 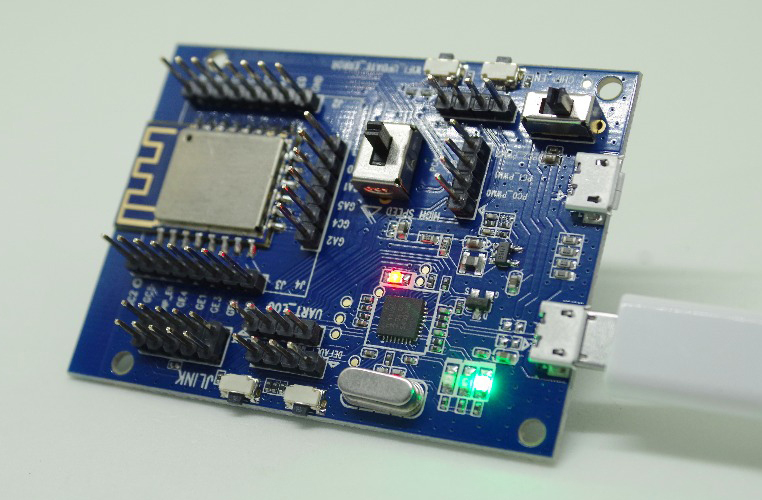 If anything, the Realtek RTL8710 isn’t meant to be a competitor to the ESP8266. While extremely popular and still very useful, the ‘next gen’ ESP32 is due to be released in a month or so, and with the exception of Bluetooth on the ESP32, this Realtek module should match its capabilities quite well. Whether anyone can get an English datasheet is another matter, but if history is any indication a few English language RTL8710 forums will pop up a few hours after this is posted. A little more than a year ago, a new product was released onto the vast, vast marketplace of cheap electronics. It was the ESP8266, and this tiny and cheap WiFi module has since taken over the space of hobbyist electronics and become the de facto standard for connecting tiny microcontrollers to the Internet. Now there’s an upgrade on the horizon. [John Lee], the public face of Espressif, the makers of the ESP8266, has announced the next product they’re working on. It’s called the ESP32, and if the specs given are correct, it looks to be the next great thing for the Internet of Things. The ESP32 will now contain two Tensilica processors running at 160MHz, compared to the ‘8266’s one processor running at 80 MHz. The amount of RAM has been increased to 400 kB, Bluetooth LE has been added, WiFi is faster, and there are even more peripherals tucked away in this tiny piece of silicon. The new ESP32 includes new, simplified APIs and unlike when the ESP8266 was announced, documentation in English. Right now, Espressif is beta testing the ESP32, with about 200 boards manufactured so far. If you’re one of the few lucky people who have one of these boards on your workbench, we’d love to see your take on it.